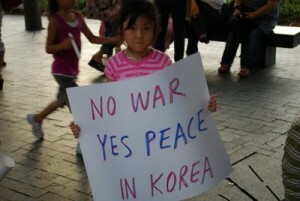 No War, Yes Peace in Korea. Photo via koreareport2.blogspot.com. War will destroy not only invaluable human lives and nature but also cultural heritage, property, and so on that human beings have created and accumulated throughout their long history. Korea has painful memories of the Korean War, which broke out 60 years ago and ended up killing over three million people and devastating the entire country. Within 60 years, the South Korean people achieved remarkably rapid economic growth and enjoyed an expansion of democracy. We believe that war, which can destroy such precious achievements made by Korean people, cannot be justified by any cause or pretext. If the war breaks out again in the only divided country left in the world, it would bring distress and despair to the citizens of the world as well as to the people of both North and South Korea. We call on authorities of both Koreas to resolve the crisis by means of khanti, patient endurance and dialogue, to prevent the war. If both sides’ hostile actions and disagreements end, they should have patient endurance in their minds. One’s patience does not mean its surrender to either side, rather patience is one of the most responsible and affirmative mindsets needed to avoid conflicts and disputes among different communities and even individuals whose interests differ. In the meantime, both Koreas should unconditionally resume talks immediately. We believe that talking face-to-face is itself a positive action for peace. According to the Nibbana Sutta, the Buddha said that there will be no causes to enter the quarrels when one attributes a great virtue to others while ascribing faults to oneself. North and South Korea are racially homogeneous countries. When the two Koreas maintain hostile policies towards each other and refuse diplomatic talks, even a small problem can become a big crisis. On the other hand, both Koreas can overcome a crisis, no matter how urgent the surrounding situation, if they resume and continue inter-Korean dialogues with endurance. Two Koreas must meet and talk in order to maintain operation of Gaesong industrial complex, the symbol of inter-Korean cooperation. We sincerely hope that the nuclear weapon programs and military confrontation, including the arms race, will be stopped on the Korean peninsula. Nuclear weapons will lead to horrific disasters and tragedies that humanity cannot handle. The claim that nuclear weapons cannot be appropriate requires that war be prevented. Both Koreas should stop the arms race simultaneously. Peace achieved by military power is not sustainable as a fire cannot be put out by a fire. We also hope that North Korea will give up its nuclear development policy and that South Korea will stop building up arms to promote mutual trust and a positive mood to guarantee peace. The role and responsibility of neighboring countries including the U.S to promote peace on the Korean peninsula are significant. They should take active steps so that North Korea can come to the dialogue table with ease. We urge the president of the United States, Mr. Barack Obama, to make efforts to send a special envoy to North Korea and resume talks with that country. Other countries like China, Japan and Russia should also adopt diplomatic policies and approaches to prioritize peace on the Korean peninsula rather than their own interests. The South and the North are not enemies to each other. War is a genuine enemy not only to both North and South Korea but also to the international community. We Buddhists pray that the governments and citizens of both North and South Korea will make every effort to peacefully break through the danger of the war which can bring about violent, bloody, and tragic results. Let us make all these endeavors for not only peace of the Korea peninsula but also for the peace of the entire world.